Rhyming my sentences, I'll try to avoid, or before too long, you'll all get annoyed. The temptation is there, but I'll give it a miss, I want my review to get cheers, not a boo or a hiss. Although it'd be quite cool, to write this in rhyme, to be quite frank, I just don't have the time. But that's beside the main point, I have something to do, so here it is folks, here's my Lorax review! One thing that struck me as particularly interesting about Dr. Seuss' The Lorax is the way that the classic literary tale has been adapted for the big screen, in particular the narrative structure that they've opted to present it in. Essentially the film is made up of two stories - the current predicament of Ted and the O'hare corporation who are selling air to the inhabitants of Thneedville, and the old tale of The Once-ler and The Lorax and what happened to all of the trees in the first place - both of which are presented simultaneously through the film, connected together with The Once-ler telling his story to Ted. Whilst this is not a particularly new way of presenting a film, and a non-linear narrative structure being something that other filmmaker have experimented with much more in other films, as a family film it is interesting to see something more than a standard linear narrative being used; something that works to this film's strength. With its two stories - Ted's being mostly unique to the film whilst The Lorax/The Once-ler's originating from and remaining faithful to Seuss' original book - we are presented with a pleasant enough story, with a touching and thought provoking environmental message which is shown heavily throughout - giving The Lorax the biggest 'save the planet' massage in cinema since Avatar and Wall-E! The message is more than clear enough, but serves its purpose well by informing the very young rather than being too in your face as to put you off. The Lorax also boasts a very good soundtrack with its unique original songs that reinforce its messages whilst helping the film to move along, and being damn catchy at the same time too; the higlight song being The Once-ler's 'How bad can I be?' which is sung by Ed Helms (from Jeff, Who Lives at Home), making it especially hard to resist for anyone who's seen The Hangover ("Dug, Dug, Duggy-Dug-Dug..."). Evoking a sense of irresistible Seussical-ness, the memorable and humorous songs are a great asset to the film. However, whilst the songs bring a Seuss like vibe to the proceedings, in many respects the film simply doesn't feel as Seussical as you'd want it to be. The iconic quirky style of the Seuss worlds, characters and creatures in many respects aren't really all that prominent in this film bar a few exceptions, instead we get a slightly more real-world set of characters and creatures in order to reinforce the metaphor for the prallels within our own world that form the film's environmental message. Alongside this, with its cutesy woodland characters such as the cuddly bears et al. 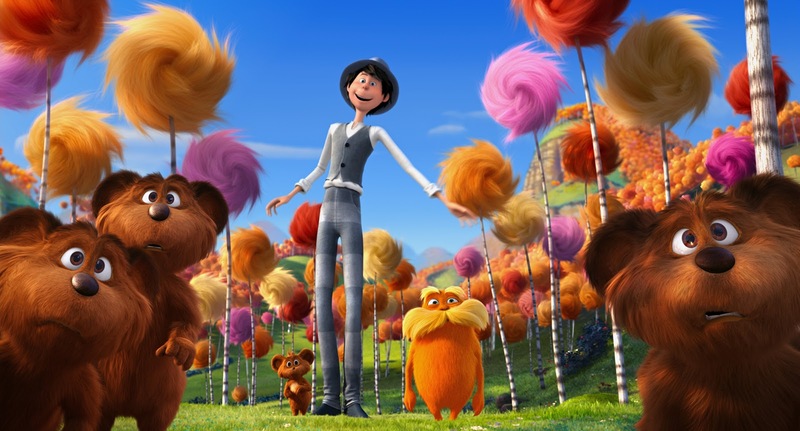 The Lorax appeals to very young children more than it does to the entire family as you'd expect from an animated film heavily marketed as coming from the makers of the hugely popular Despicable Me. There are some gags there for the whole family, but the majority feels as though it's being aimed at the younger members of the audience as it tries to educate them with its environmental warning. This is a shame as it's limited market truly let's the film down. Placed next to any film made by Pixar Animation Studios, and suddenly The Lorax feels somewhat unremarkable in comparison. 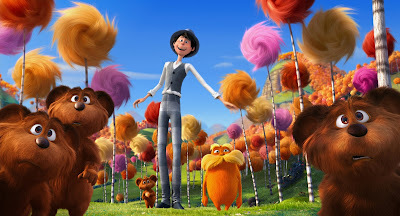 A pleasant enough film with an enjoyable enough story, catchy enough songs and a environmental message that is actually quite heartwarming, Dr. Seuss' The Lorax limits itself by being a film that ends up being more appealing to the very young rather than something for the whole family. Not quite as Seussical as you'd want it to be either, the film is good enough to watch and enjoy, but not good enough to last in your memories or to become anything particularly timeless. It'll always be a difficult challenge for an animation studio to beat the films of Pixar, and with Brave being released in just a few weeks, the overwhelming legacy of this studio unfortunately hinders The Lorax (Wall-E 1-0 Lorax); but with an adaptation of The Cat in the Hat coming soon from the same studio, it's better luck next time Seuss! All this Seussical whimsicalness, I'll leave to the pro, because right now, it's about time I go. So long all my friends, hope you enjoyed my review, I have seen The Lorax, the question is: will you? 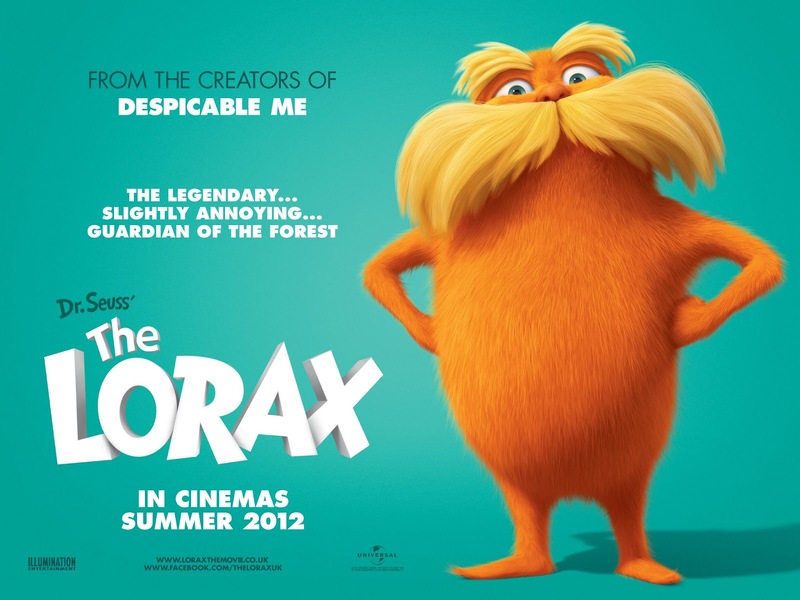 Dr. Seuss' The Lorax is released in cinemas across the UK on July 27th 2012 (Advanced Previews on the 21st and 22nd July). Will you be visiting The Lorax? If you've seen it what did you think? Leave your comments below!